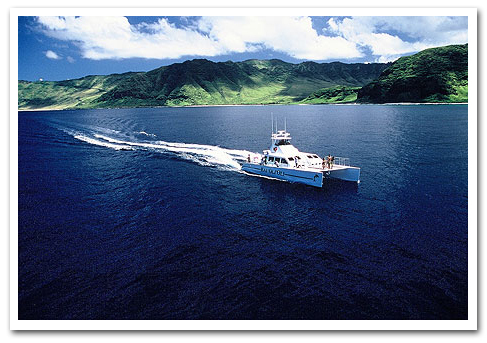 Dolphin Watching, Sightseeing and Snorkeling Cruise - Hop aboard Oahu's only marine vessel designed exclusively for the best ocean activity experience. Our Mid-Day Afternoon Adventure Calm Cruise adventure is a premier experience that will take you up the entire Waianae coast (west coast of Oahu), from Ko Olina Marina to various points along Oahu's western coastline. Goes about 40-50 miles round trip, and emphasizes going all the way to beautiful Makua Valley, Yokohama Beach and even Ka'ena Point during sunset time. 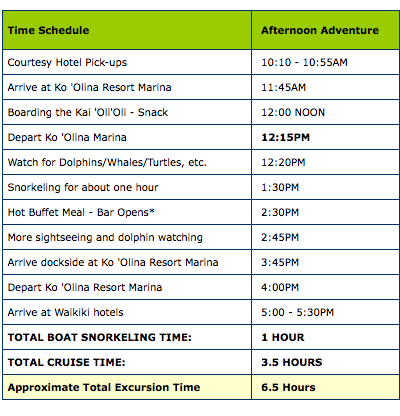 Has a total boat time (snorkeling plus cruise/watching time) of 3.5 HOURS.